Twitter, at one time more resistant to shut down accounts due to free speech concerns, seems to be turning around. Watchdog groups say that the social network was unusually fast in erasing extremist material on the site after the Nice attack in France this past weekend. This is a change from the social network’s actions after similar terrorist attacks in Paris and Brussels. Obviously Twitter—along with Facebook, Google, and basically all sites—has long said that it doesn’t allow extremist comments, its reaction after similar attacks was not nearly as quick. 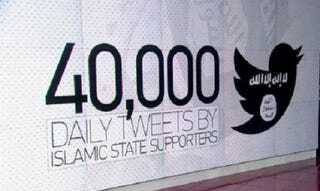 This “swiftness” comes as increased scrutiny is being placed on the role of social media in encouraging extremism. A father of the a Paris attack victim has sued various social media sites, including Twitter, for “knowingly” letting ISIS recruit on their platforms. A similar lawsuit was filed by the wife of an American man killed in Jordan. Though these lawsuits are unlikely to hold up in court, they do show the desire to blame the sites for being breeding grounds for terrorist attacks that may not have otherwise occurred. Still, we may be winning the social-media war against ISIS, as Twitter traffic to pro-ISIS accounts has fallen 45 percent in the past two years. That’s some real progress. Now, if only that algorithm for predicting terrorist attacks worked consistently. Angela Chen is the morning editor at Gizmodo.